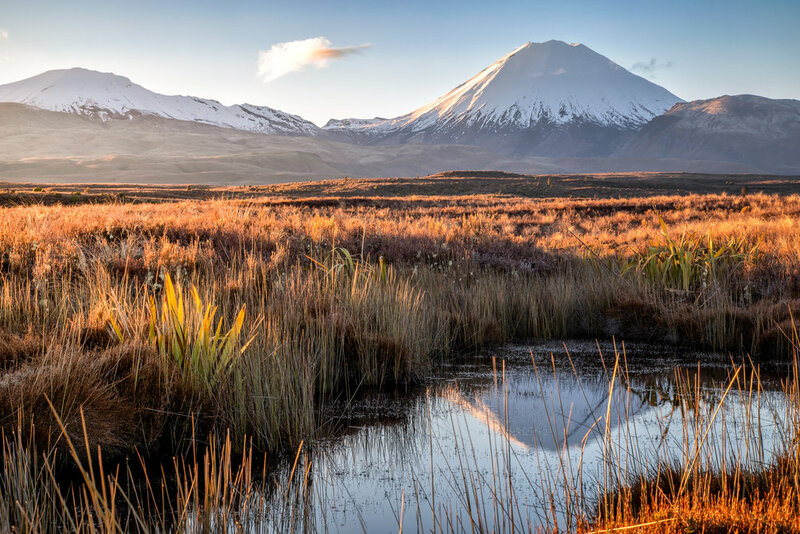 The mission: Spend a long weekend in Tongariro National Park, do some landscape photography at the beginning and end of each day and spend the middle of the days relaxing and maybe a spot of fishing. I can insert a proud check mark alongside each of those points. In fact the photography was so successful that I'm going to spread it over 3 posts, I really was blessed with some fantastic light! The first morning I returned to a spot that I'd photographed a few years ago. It was a spot just off State Highway 47 that offered a great view of Mt Ngauruhoe with a small pond that, when the conditions are still, reflected the mountain. The morning was crisp and cold, I found the spot, set up my tripod and waited. The sun slowly rose, hit the side of the mountain, lit the foreground and I clicked the shutter. Boom, not bad, though maybe, just maybe, this shot would be better at sunset…..next time. A few minutes went by, creep to the other side of the pond, reframe on Mt Ruapehu, click. Car, home, coffee, done.